Thank you for your response to the UCU Open Letter, which the University forwarded to our Regional Official on 11th March. We would also like to thank your team for a positive and frank JNCC meeting. In response to your letter, firstly, Surrey UCU does not consider the ‘further financial information’ that was provided on the 4th March as sufficient. As a world-leading institution, pioneering evidence-based research and teaching, the University Senior Management will understand what is meant by granular, detailed data, which the trade unions have repeatedly requested. Simple pie charts and graphs without substantive background data are not sufficient evidence to justify potential staff cuts. For staff to have confidence, greater and better data need to be produced. Secondly, it would be helpful if you could clarify what you consider to be ‘full and meaningful consultation’. Providing a series of briefings for trade unions, where suggestions or recommendations are not incorporated into University planning, does not constitute consultation. An example of this is strikingly illustrated by your reference to asking trade union committees to endorse the EVS scheme, a request which took place four days before opening this scheme to all staff across the University, without time to consult union members or recommend alterations. We urgently request that you review and revise the nature of the consultations between University of Surrey Senior Management and the three campus trade unions. We look forward to assurances and action on your part. In the event that there is no alteration, Surrey UCU will vigorously and publicly oppose assertions that genuine consultation has taken place, or that University of Surrey has provided figures that constitute a proper business case. For the absolute avoidance of doubt all three campus unions oppose compulsory redundancies. Therefore, we request, notwithstanding our disagreement with the business case presented, a reopening of the EVS scheme, should the current scheme not yield sufficient savings. Allied to this, joint working on non-staff cost saving measures including the use of consultants, University Executive Board pay and current business ventures and partnerships. We look forward to a prompt, positive response from yourself. UCU members and the wider University community are extremely concerned at the content of your message to staff. Job security, workload and increased precarity are three of many areas highlighted at our very well attended meeting held on the 4th March. The presenting reasons provided for the programme of cuts of ‘reduced income due to Brexit and an ever more competitive student recruitment environment, significantly increasing pension costs and a national review of tuition fee levels’ are far too vague to convince staff they are necessary. We expect a much more data driven and evidence based economic, technical and organisational case to justify such swingeing cuts. For this reason we expect full and meaningful consultation with the trade unions and a transparent examination of the employer business case over the coming period. An early meeting with Michael Kearney and Anne Poulson is therefore necessary. However, the main purpose of this letter, notwithstanding our view that the business case for cuts has not been made , is to seek some early assurances so that staff do not have the spectre of uncertainty hanging over them. Firstly, you raise the issue of the potential for ‘compulsory redundancies’. We therefore request that you provide a categorical assurance that no member of staff that UCU has bargaining rights for will be made compulsory redundant this calendar year. Secondly, we request that no member of staff currently on a fixed term or hourly paid contract will suffer a detriment this calendar year as a result of the programme of cuts proposed. Thirdly, we recognise that an EVS scheme has to fully incentivise applicants in order to reduce the risk of compulsory redundancies. As this is our paramount goal we ask that you keep the EVS application process open until at least the end of this academic year. This would allow those considering this option the time to make financial decisions which could involve checking pension data, considering reducing hours on a permanent or temporary basis, unpaid sabbatical etc. A three week period is not long enough for such life changing decisions nor to get the feedback required on the various options. Finally, a 6 month period, after which an employee can be made compulsory redundant without an unsuccessful application for EVS being honoured, is far too short. We request that this period should be extended to a year after application for EVS. I look forward to a positive and speedy response from yourself. Surrey UCU opposes any move of the University of Surrey towards Compulsory Redundancies, because there is a lack of financial transparency and argument based on data. – the University recognises the vital contribution made by staff who have been employed on fixed-term or hourly-paid contracts, and provides reassurance that those on such contracts shall continue to participate at the University as valued employees, and be protected from any change in policy relating to recruitment. 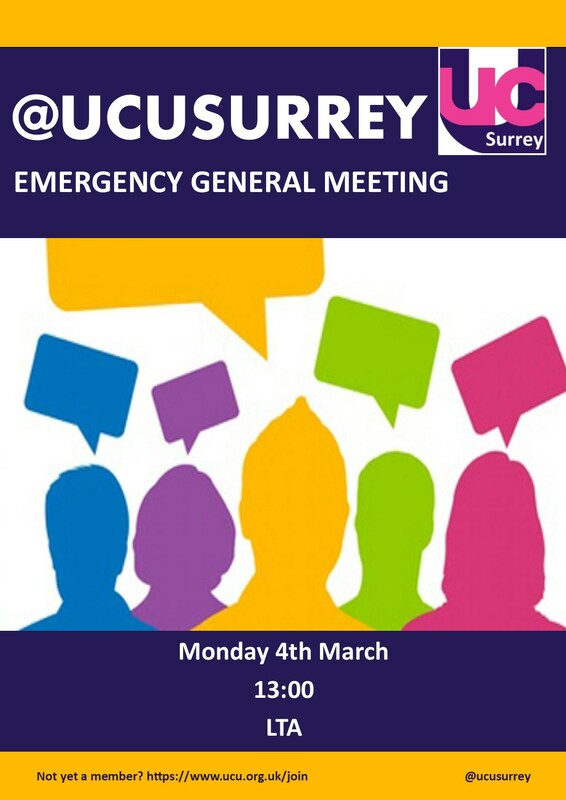 Please do not hesitate to contact us with your views, we are committed to remaining in touch with all our @ucusurrey members. Thanks all, more updates to follow. We all get used to it. The dripping tap scenario. It could be the leaky gutter outside your bedroom window. Brambles growing over your garden wall. The mounting bill pile perched on the mantelpiece. It could be your pay. Higher education pay, in fact, which has declined in real terms by 21% since 2009. In general however, perhaps a few percent a year is hardly noticeable, or perhaps only a momentary annoyance when you notice your commuting cost has risen out of line with your pay packet. Now imagine you had lost that 21% overnight, or that your pay was a lot more complicated. For some HE staff, on a precarious contract, pay may not be certain. Or manageable. Or enough. UCU needs a mandate in order to pressure UCEA into negotiating nationally on this issue. The Trade Union Act 2017, designed to frustrate direct action, is not just a hurdle, it is a high jump. Expecting Branches to reach a 50% turn-out threshold although not required for any council or government election, stacks the odds against establishing a strong hand in UCU negotiations. It is essential that UCU is not paralysed and rendered ineffective. We really do need members to post that ballot paper. We need to keep reaching for that bar—and over it. As with the USS ballot, we are asking members to let us KNOW WHEN YOU HAVE VOTED (you do not need to tell us how you have voted! ), please reply or email: cmaxfield@ucu.org.uk with the single word ‘voted’ so that we can climb our way towards that ALL-IMPORTANT, ALL-ENCOMPASSING, 50% LEGAL THRESHOLD. Members may also find this article yesterday of interest – USS crisis: can the pension system be reformed? 1. Do they know what the 50% threshold means? In March 2017 the Govt introduced a 50% turn out threshold for any UK union which wanted to take legal strike action. ‘Ballots have to achieve at least a 50% turnout of eligible union members, with a majority voting in favour of strike action’. It is therefore essential that members post their ballot paper, whatever their actual vote. 2. Do they know the significance of the 2% Pay offer in real terms? The employers’ latest pay offer of 2% does nothing to restore ground lost against inflation which, as measured by the Retail Price Index (RPI), is currently 3.4%. UCU estimates that HE staff have taken a cut in real terms of 21% since 2010) when pay settlements are cumulatively compared to rises in RPI. 3. Do they know why it is a Pay & Equality dispute? You may not be aware but HE employers are increasingly resistant to national bargaining. Apart from senior pay, in higher education the only aspect of salaries that is getting bigger is the gender pay gap. The employers are currently not willing, at a national level, to address gender inequality or precarious employment in the sector. Please forward on, or knock on a door and ask a colleague!